and put the wind at your back! Aeolus brand truck tires are produced by China's largest scale tire manufacturer, who is listed as one of the world's top 50 tire enterprises. Produced with powerful technology and excellent processing equipment, Aeolus tires are superior in quality. Our truck tires have been appraised as state grade A products, have won "Excellent" grades from the Ministry of Chemical Industry and the provincial government, and have passed the ISO 9002 product quality certification. Aeolus truck tires are also DOT (U.S.A.) Certified and ECE (European Union) Approved. Consistently adhering to the service aim of "Quality First ... Consumer Supreme", Aeolus tires sell extremely well all over the country and are exported to more than 20 countries and regions. 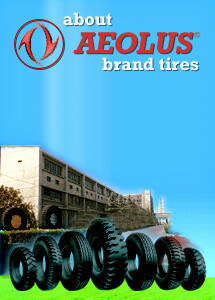 21st Century Tires has established a special agreement to promote Aeolus tires worldwide.